The cervical spine consists of upper and lower divisions. These two separate complexes make up multiple different joint articulations. Starting with the upper cervical region, the occiput of the skull and the first cervical vertebra create the atlanto-occipital joint (C0-C1), and the first and second cervical vertebrae form the atlanto-axial joint complex (C1-C2).1 At these joints, the principle motions are flexion/extension and rotation.2 According to Magee, the atlanto-axial articulation is the most mobile region of the entire spinal column.2 Restrictions for movement in the upper cervical spine include the bony contours of the joints, anterior and posterior longitudinal ligaments, ligamentum flavum, alar ligaments, transverse ligament, and surrounding musculature. One important aspect of the upper cervical spine is the stability provided by the transverse ligament of the atlas. This structure prevents the anterior translation of the axis on the atlas by holding the dens of C2 against the anterior arch of C1.2 Additionally, the alar ligaments add to the majority of the stability at C1-C2. These ligaments offer the most stability during rotational movements and help to limit flexion. The lower division consists of the remaining vertebra of the cervical spine (C3-C7). In the lower cervical spine, flexion and extension occur independently. Due to the shape of the apophyseal joints, lateral flexion and rotation must occur through coupled movement patterns. 1. Anterior view - Shoulders should appear symmetrical at the acromion processes of the scapula and chin should be in line with the sternum. 2. Sagittal view - The ears should be in line with the shoulder, forehead should be vertical, and assess for normal lordotic curvature. 3. Posterior view -Notice any asymmetry. 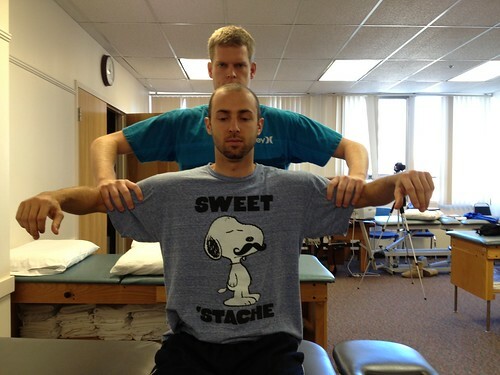 It is necessary to analyze the patient for any abnormalities in the thoracic and/or lumbar region as well. Have patient bring chin to chest and bring back to normal. Ask if patient experiences any symptoms. To apply over-pressure, have patient repeat motion and the therapist places hand on back of head while bracing cervico-thoracic junction. Have patient look up towards ceiling and then return back to normal. Ask if patient experiences any symptoms. 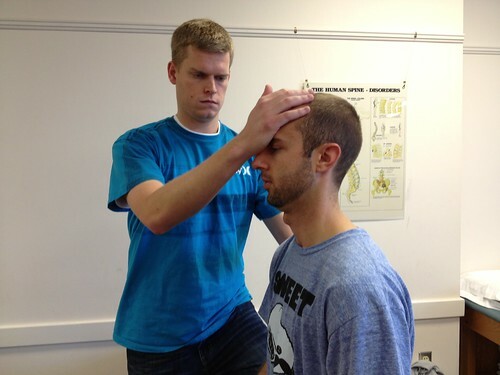 To apply over-pressure, have patient repeat motion and the therapist places hand on chin and back of head. Have patient bring ear towards shoulder and return to normal. Ask if patient experiences any symptoms. To apply over-pressure, brace the shoulder at the contralateral side of lateral flexion. Perform bilaterally. Have patient turn head towards shoulder and return to normal. Ask if patient experiences any symptoms. To apply over-pressure place one forearm on upper back with hand on same side of face. Other hand is placed on contralateral side of face. Perform bilaterally. Patient is brought into cervical extension, the head is rotated and laterally flexed to the same side. Over-pressure is placed with both hands on both sides of head with force pushing into extension, rotation and lateral flexion. Patient is asked to tuck chin in towards neck. Ask patient if they experience symptoms. Over-pressure is performed with one hand on superior aspect of posterior skull with the other hand on the chin. 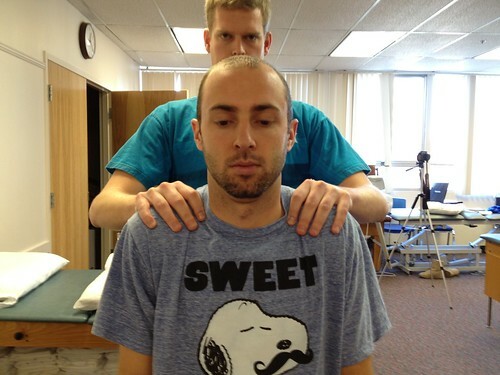 Ask patient to slump forward and stick chin forward. Ask patient if they experience symptoms. 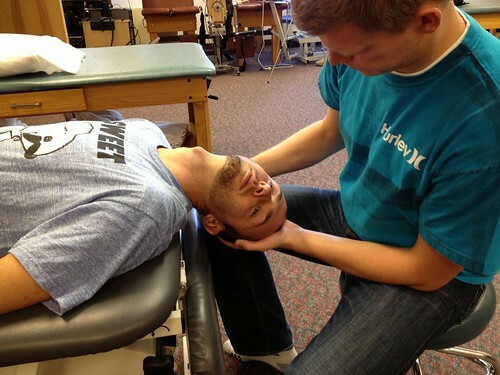 Over-pressure is performed with one hand on superior aspect of posterior skull with the other hand on the chin. This is a passive motion only. 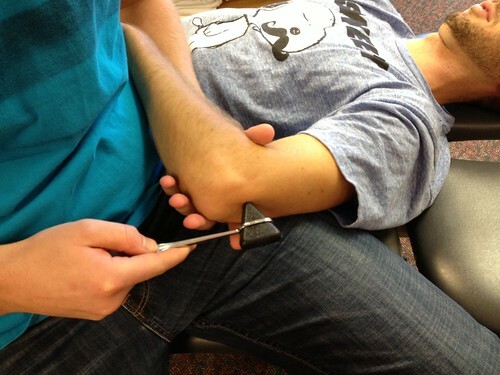 The therapist places the ulnar border of hand over transverse process of C2 while laterally flexing with opposite hand. 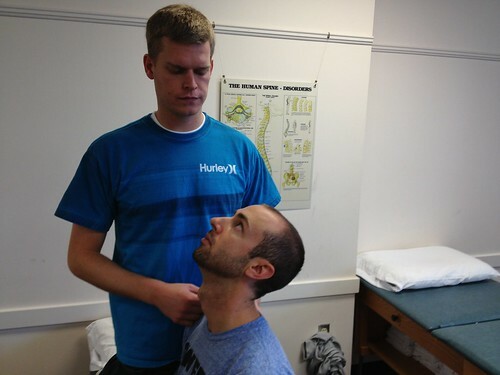 Ask patient to slump forward and stick chin forward. With hands in similar position as extension, maintain extension OP while rotating and side bending. 1. Shoulder – Elevation through abduction and forward flexion. 2. Elbow (patient supine) – Flexion/extension, supination/pronation. Be sure to apply over-pressure after patient goes through available range. 3. Wrist – Flexion/extension and grip strength. Use over-pressure at end range. The therapist may use a semi-sharp object to dot along the dermatomal path. Compare bilaterally. 1. Soft tissue exam for inflammation (heat, redness, edema, spasm). 1. Neuman AD. Kinesiology of the Musculoskeletal System: Foundations for Rehabilitation. Missouri: Saunders Elsevier; 2010. 2. Magee DJ. 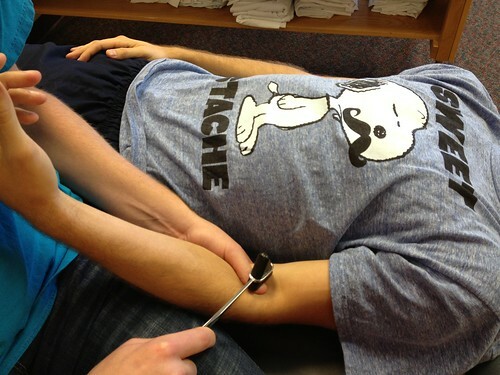 Orthopedic physical assessment. Missouri: Saunders Elsevier; 2008.